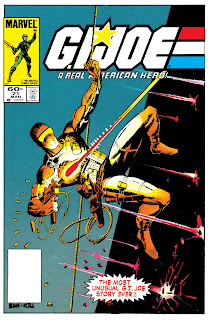 Marvel Comics of the 1980s: 1984 - G.I. Joe #21 "Silent Interlude"
One thing to keep in mind as you read this is that I didn't read G.I. Joe regularly in the 1980s. I picked up a couple of issues here and there, but I was never pulled into the Joe universe. Even this issue's impact and influence had escaped me. However, "The Most Unusual COMIC BOOK Story Ever!" is easily the first issue that gets mentioned when I talk to anyone about Marvel's G.I. Joe comic series. The plot is pretty straight forward. 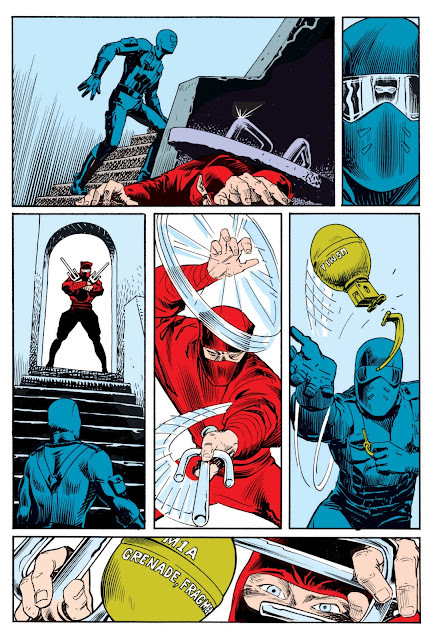 A new Cobra ninja, Storm Shadow's first appearance, brings in a captured Scarlett. 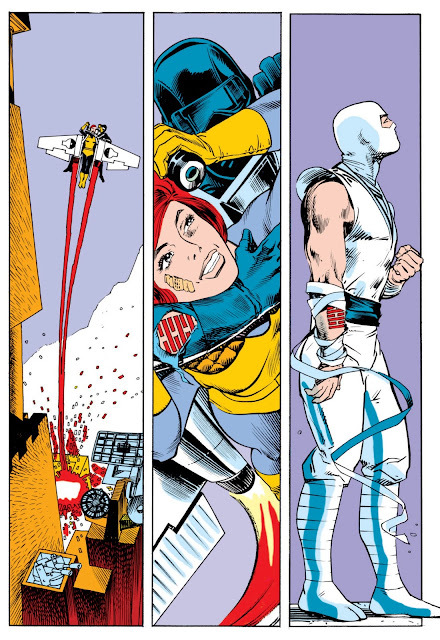 Fortunately, Snake Eyes came to her rescue, although she wasn't exactly a damsel in distress. 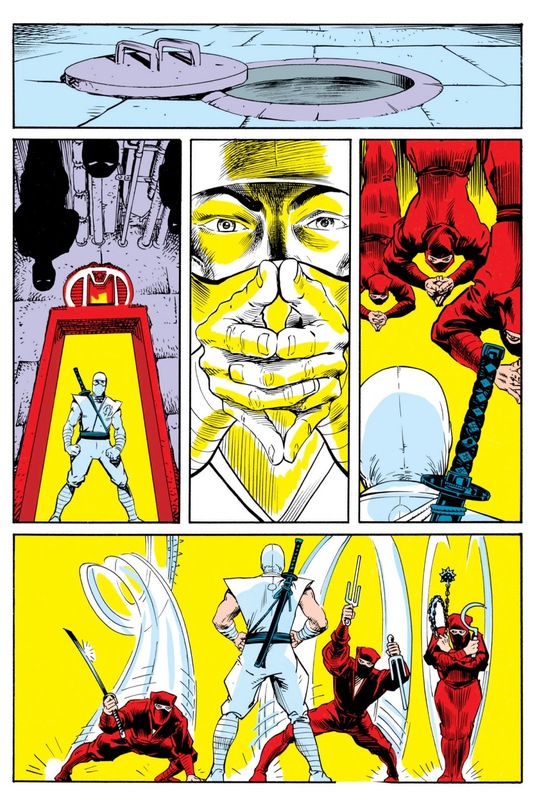 The last page sets up a connection and back story between Storm Shadow and Snake Eyes as they had the same tattoos. That tattoo being an identifier for the Arashikage ninja clan. While it wasn't the first time a comic didn't have any dialog or narration (see Will Eisner's The Spirit), but Hama pulled it off quite well. I believe one of the reason this works is that Hama not only wrote this issue, but drew the breakdowns. Interestingly, I spotted Leialoha's name before reading it and was on the look out for his work as it has its own unique style, which helped convey those subtle facial expressions. The backgrounds are minimal at best and it looks like it was intentional, allowing the reader to focus on the characters and their motions. The action is smoothly conveyed. Since the issue spotlighted Snake Eyes, a character who didn't speak, it focused on a lot of action, delivering almost 22 pages full of action. Although there is one bit of fun narration that Hama sneaks into the story, the writing on a fragmentary grenade that's tossed at a charging ninja. "I wanted to see if I could do a story that was a real, complete story – beginning, middle, end, conflict, characterization, action, solid resolution – without balloons or captions or sound effects. I tried to do it again, as a matter of fact, with the Joe Yearbook #3 story." Hama actually pulled off a third silent issue in 2010 with G.I. Joe: Origins #19. I remember reading this when it came out and being half way through and realizing there were no words. The art was very good and it sets up a lot of recurring elements. 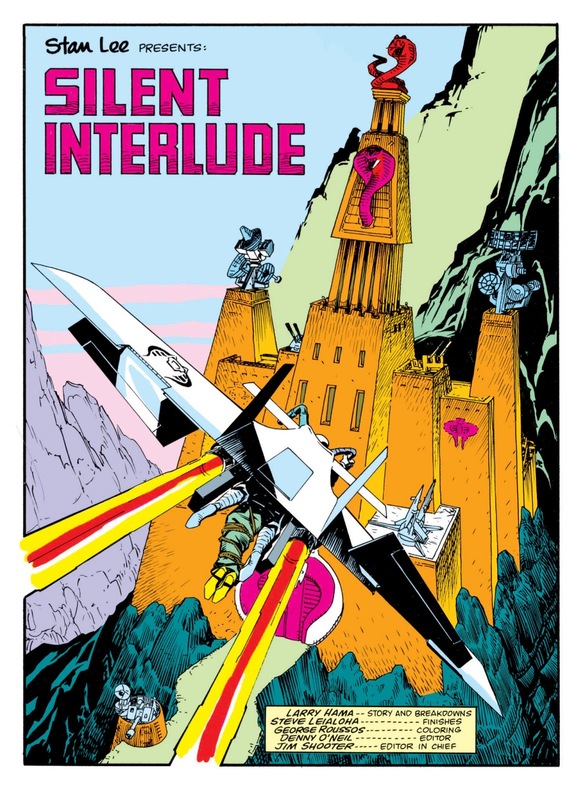 I wish Destro's Castle was always portrayed like it was here instead of the ridiculous transformer castle. I would be happy if there were no more silent or homages to this issue as none of them have been any good including Yearbook 3 which was very forgettable. This was the first comicbook that I bought myself and I was attracted by the cover and didn't realise it was wordless on first reading because everything seems to move along nicely. It got me hooked up to the comic reading & collecting up to now. Those were the good times! This is a must have, not only for any G.I. Joe comic book fan, but for Snake Eyes/Scarlett fans as well. Hama also proved that these two can be a team/couple without any words or dialog... but sadly, one so-called writer after the other has failed to understand or learn from Hama's examples. This is my all time fav comic! Hama is just amazing - and extremely underrated as a writer.